Nelson Ramón Cruz Martínez Sr. (born July 1, 1980) is a Dominican professional baseball right fielder and designated hitter for the Seattle Mariners of Major League Baseball (MLB). He has also played in MLB for the Milwaukee Brewers, Texas Rangers, and Baltimore Orioles. Cruz has also filled in as a left fielder throughout his career. Cruz is a four-time MLB All-Star. He was named the Most Valuable Player of the 2011 American League Championship Series, in which he hit six home runs and recorded 13 runs batted in, both MLB records for a single postseason series. On August 5, 2013, Cruz was suspended 50 games by Major League Baseball for his involvement in the Biogenesis scandal. In 2014, he led the American League in home runs. Cruz was born on July 1, 1980 in Las Matas de Santa Cruz, Dominican Republic. 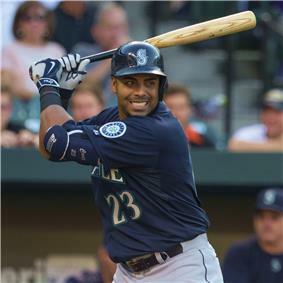 His father, Nelson Cruz, Sr., also played professional baseball in the Dominican Republic. Both his parents are successful professors and raised Cruz and their two daughters, Nelsy and Olga, in a well-to-do Dominican neighborhood. Growing up, Cruz's passion was for basketball, not baseball. His idol was Michael Jordan and as a teenager Cruz played for the Dominican Republic Junior National Basketball Team. He attended the high school where his father taught history. In addition to playing sports, Cruz worked as a mechanics helper with his uncle at a tractor factory. He also shined shoes and learned how to repair them. In September 2012, he donated $20,000 to help buy a firetruck for Las Matas de Santa Cruz, enlisting AMR's help in also donating two ambulances. Cruz was initially signed as a non-drafted Rey Ordóñez was out with a broken arm, and Melvin Mora, Mike Bordick, and Kurt Abbott proved unable to fill in. Cruz spent four years in Oakland's minor league system then was traded on December 16, 2004 to the Milwaukee Brewers for infielder Keith Ginter. Cruz spent the 2005 and 2006 seasons in the Brewers organization, primarily with the Double-A Huntsville Stars, Triple-A Nashville Sounds. He made his major league debut with the Brewers on September 17, 2005 as a late inning defensive replacement against the Houston Astros. He had one hit in five at-bats for the Brewers in limited action. His only hit was a double off Aaron Harang of the Cincinnati Reds on September 28. On July 28, 2006, the Brewers sent Cruz and outfielder Carlos Lee to the Texas Rangers in exchange for Laynce Nix, Kevin Mench, Francisco Cordero and minor league pitcher Julian Cordero. He hit his first home run on July 31 against Willie Eyre of the Twins. On August 16, Cruz hit the first grand slam of his career off of Kevin Gregg of the Angels. On September 4, 2006, against the Athletics, he hit an inside-the-park home run in which his bat broke on impact. In spring training for the 2007 season, Cruz got off to a rough start, but finished strong by hitting three home runs in the final week, including a walk-off home run in the final game of spring training. Cruz failed to make the major league roster prior to the 2008 season and cleared waivers after being designated for assignment because he had exhausted his minor league options. On August 25, 2008, the Rangers purchased Cruz's contract from the Triple-A Oklahoma RedHawks. With the RedHawks Cruz had a .341 batting average and had 37 home runs and 100 runs batted in (RBI); for his efforts with the RedHawks, Cruz won the 2008 Pacific Coast League MVP award. In July 2009, Cruz was selected as an All-Star as a replacement for injured Torii Hunter. He also participated in the 2009 Home Run Derby, finishing second to Brewers first baseman Prince Fielder. He and teammate Ian Kinsler each hit three home runs in the 2010 AL division series against the Tampa Bay Rays, marking only the second time in Major League history that two teammates each hit three homers in a postseason series of five games or fewer (joining Babe Ruth and Lou Gehrig, who did it in the 1928 World Series). In Game 5 of the 2010 World Series vs. the San Francisco Giants, Cruz hit a home run off of Tim Lincecum in the 7th inning. In 2011, Cruz and Ian Kinsler became the first two teammates in major league history to homer in each of the first three games in a season, joining Dean Palmer (1992) as the only Texas ballplayers to ever homer in the first three games of the season. Also, in his very next game, Cruz became the third player ever to homer in each of the first four games of the season, joining Willie Mays and Mark McGwire. Cruz became the second hitter to hit a home run into the upper deck in right field as a right-handed batter in the history of Rangers Ballpark in Arlington. The other was hit by former Ranger Chad Curtis, during the 2000 season. On July 22, he had 8 RBIs in a game against the Toronto Blue Jays; it was Cruz's career high in RBIs. In 2011, Cruz batted .263 with 29 home runs. He led AL right fielders in range factor for the third straight year (2.29). On October 10, 2011, Cruz hit a walk-off grand slam in Game Two of the ALCS versus the Detroit Tigers. He became the first player in baseball history to hit a walk-off grand slam in a postseason game. Cruz hit a 3-run home run to seal game 4 of the ALCS for the Texas Rangers against the Detroit Tigers. He became the first player to hit multiple extra-inning home runs in the same postseason series. During the 2011 ALCS, Cruz hit 6 home runs and had 13 RBIs, both postseason series records. His efforts earned him the 2011 ALCS MVP award. Cruz hit a solo home run to put the Texas Rangers up 6 to 4 against the St. Louis Cardinals in Game 6 of the 2011 World Series. The home run allowed Cruz to tie the record for most postseason home runs in a season at 8; he shares the achievement with Carlos Beltran and Barry Bonds. The Rangers lost the series to the Cardinals. In January 2013 Cruz was linked to buying performance enhancing drugs from a clinic based out of Miami. On August 5, 2013, Cruz was suspended 50 games by Major League Baseball for his involvement in the Biogenesis scandal. 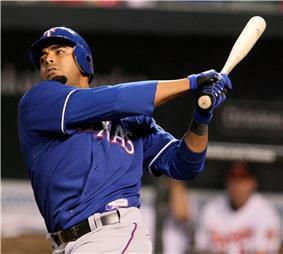 Cruz became a free agent following the 2013 season, turning down a $14 million qualifying offer from the Rangers. The fact that he had draft pick compensation attached to him and lingering concerns over his recent PED suspension made it difficult for him to find a new deal during the offseason. Cruz with the Orioles in 2014. Cruz signed a one year, $8 million, contract with the Baltimore Orioles on February 24, 2014, . On July 5, Cruz had his first career 5-hit game, with two singles, two doubles, and a home run, falling a triple shy of the cycle (he was tagged out just short of third base), against the Red Sox. Cruz was elected into his third MLB All-Star Game, as a designated hitter, for the American League. On September 7, 2014, in a game against the Tampa Bay Rays, Cruz went 4-for-5 with two home runs and 7 RBIs, including his 100th RBI of the season. His previous season high in RBIs had been 90, set in 2012. Cruz drove in all 7 runs the Orioles scored. In 159 games played of the 2014 year, Cruz had an MLB-leading 40 home runs along with a .271 batting average, 32 doubles, and 108 RBI. In the first game of the 2014 ALDS, Cruz homered against the Detroit Tigers' Max Scherzer. It was his 15th home run in 35 career postseason games, tying Cruz for 10th place on the all-time postseason home run list with Babe Ruth. In the third game of the 2014 ALDS, Cruz hit his 16th postseason home run against the Tigers' David Price, tying him for 9th place on the all-time postseason home run list with Carlos Beltran. Cruz declared free agency after rejecting the Orioles qualifying offer of $15.3 Million. On December 4, 2014, Cruz signed a four year contract with the Seattle Mariners worth $57 million. Cruz and Solani Genao were married on December 25, 2009. They have a daughter, Giada, and a son, Nelson, Jr.
^ Robin Ventura of the New York Mets would have been the first, but he never touched home plate after hitting the ball over the fence with the bases loaded to win a 1999 postseason game against the Atlanta Braves. Ventura's hit came to be known as the Grand Slam Single.